5 Km from Town east Banlong Town. Is the natural lake (700,000 year old Volcanic crater lake), which locates in the middle of the mountain in Yeak Loam Commune, Ban Lung District in five-kilometer distance from the Ban Lung town. The lake has square shape, approximate 800-meter diameter and 48-meter depth during the dry season and is ringed by a 2.5 km hiking trail, and occurs by volcano for centuries. The lake has clear water as the sea suitable for swimming, and there are two harbors protruded to the above of the water for tourists to view the scenary and birds that are swimming along the stretch of the forest surrounding the lake. At the western bank of the lake, there is a tourist information center guiding and giving information to tourists, and also for displaying souvenirs and handicrafts made by ethnic minorities. Tourists like going to Yeak Loam Lake for swimming and hiking along the forest surrounding the lake; they usually package their food along when going. Yeak Loam Lake worshipped by ethnic minorities at the nearby because they believe that there is spirit who lives, protects and owns the territory and forest here. 8Km west of Banlong town and it flows throughout the year. Locates at the middle of forest in Cha Ong village, Ou Chum District in approximate two-kilometer distance from the Ban Lung town by the National Road No.19 (Ban lung-Steung Treng), then turning right by a trail about six Kilometers. We call the waterfall Cha Ong because we follow the ethnic minority of Kreung at Cha Ong village closed to the waterfall. The source of this waterfall is from the mountain named Ey sey Pak Ta Mak or called Phnom Svay closed to the Ban Lung town. The situation from above is a small canal which continuously flows through the broken rocks, then to the stream below in 25 meter height. To view the waterfall, we should go down to the stream below where we have seen a big rocky cave with plain roof. At the bottom of the stream, there are many big rocks used as the seats for viewing the great and interesting water falling down from the mountaintop. 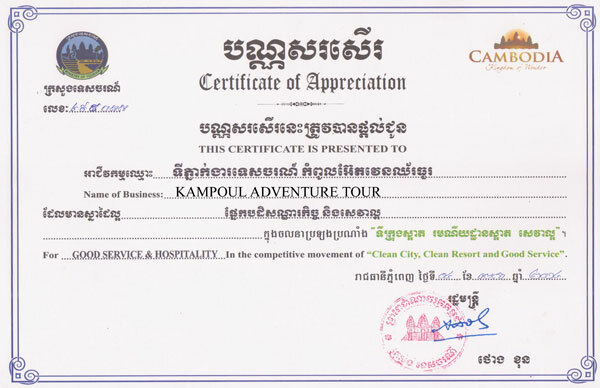 Locates at Ka Chanh Commune six-kilometer Distance from the Ban Lung town. The waterfall has 12-meter length and non-stop flows along a canal named ?Ou Kan Teung? to Sre Pork River in Sam Phat district. We call the waterfall ?Ka Chanh? because we follow the ethnic minority of Kreung at Ka chanh village. Among the river and rubber plantation, which projects the pleasant and cool shadow, the waterfall of Ka Chanh also provide the great scenary in attracting tourists to visit and view the waterfall. In order to go down to the stream?s bottom, we go by a wooden stair with approximate 72 steps. At the up streamside, there are big trees branching out and projecting cool shadow where tourists like having picnic here. Lacates at Lbang I Commune, Lum Phat District in seven-kilometer distance north - west of Ban Lung town, and below Ka Chanh waterfall about three Kilometers. We call the waterfall ?Ka Tieng? because we follow the ethnic minority of Kreung at Ka tieng village. Ka Tieng waterfall has approximate 10-meter height, and flows down to the stream. Around the waterfall, there is forest full of big and small trees projecting the cool shadow suitable for resting. 23 km (46mn) north of Banlung. Nature & Wildlife Preserves, beside this the tourists can go visit the ethnic villages, ethnic culture (tradition belief, festival, dancing, music). Location: Kok Pnong Village, Bakam Commune, Ou Ya Day District. Is the long-plain and rocky terrace surrounded with forest full of big trees, and locates at Ou Chum Commune, Ou Chum District, Rotanakiri province. Viel Rum Blong can be accessible by the provincial road from Ban Lung town to Ou Chum District about 10-kilometer distance, then turning right at the four-conjunction road to Ta Veng District about four Kilometers more. A story of Kreung minority said that: Once upon the time, there was a boy named Rum Blong who flew a kite in this rocky terrace. The kite fell down and got stuck at the top of a tree. The boy climbed up the tree to take the kite, but unfortunately the boy fell from the tree and died here. The corpse of the boy was buried at the forest here. Since that time, the Kreung national who live at the nearby village believe that spirit of the boy, Rum Blong is living here for protecting the forest arround the terrace. So that, they dare not to cut down the forest to plant their crops because they believe the forest belongs to the spirit. So the name of the terrace ?Rum Blong? comes from the boy?s name since that time. Visitors who visit the rocky terrace usually package their food along for having picnic here. Nature & Wildlife Preserves, 40 km (1h:20mn) South of Banlung with a total area of 250,000 ha. There are special kinds of animals and bird like tigers, elephant, red-headed vultures. Location: Thmey Village, Cheyoudom Commune, Lumphat District. Ou'Sensranoh Waterfall is situated 9 km. south of Banlung. The height of it is 18m and the water flows and falls all the time. The visitors can go there rest and enjoy the fresh air, or to see the forest and listen to the birds ' cries.